Ca2+ and Cu2+ ATPases are enzyme proteins that utilize ATP for active transport of Ca2+ or Cu2+ across intracellular or cellular membranes.1-4 These enzymes are referred to as P-type ATPases since they utilize ATP through formation of a phosphorylated intermediate (E-P) whose phosphorylation potential affects orientation and affinity of bound cations by means of extended conformational changes. Thereby specific cations are transported across membranes, forming transmembrane gradients in the case of Ca2+, or accepting Cu2+ from delivering proteins on one side of the membrane and releasing it to carrier proteins on the other side. 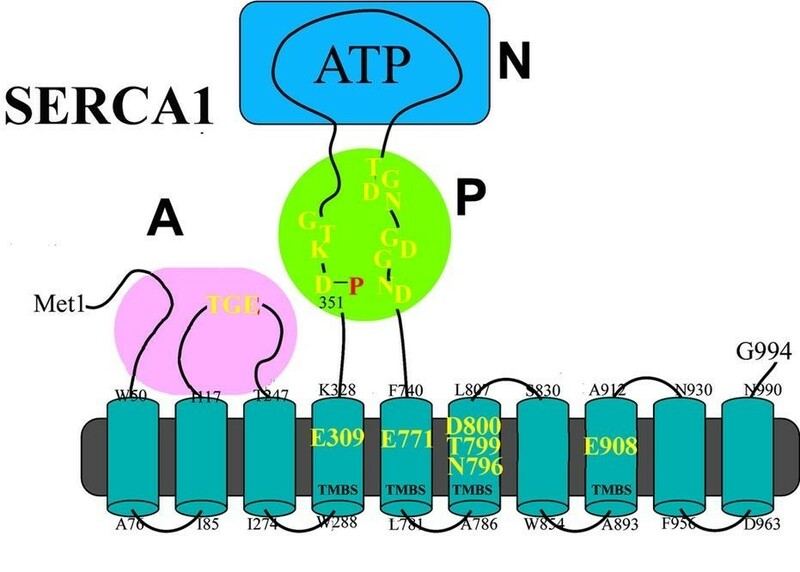 Binding of Ca2+ or Cu2+ is required for enzyme activation and utilization of ATP by transfer of ATP terminal phosphate to a conserved aspartate residue. The ATPase protein is composed of a transmembrane region composed of helical segments and including the cation binding site (TMBS), and a cytosolic headpiece with three domains (A, N and P) containing the catalytic and phosphorylation site. The number of helical segments and the cytosolic headpieces present significant differences in the two enzymes. In addition, details of transmembrane cation extrusion are different. The Ca2+ and Cu2+ ATPase sustain vital physiological functions, such as muscle contraction and relaxation, activation of several cellular enzymes, and elimination of excess cation concentrations. A historic review of studies on chemical and physiological mechanisms of the Ca2+ and Cu2+ ATPase is presented. Giuseppe Inesi obtained MD and PhD degrees at Modena and Bologna. He was then a postdoctoral fellow at the University of Pennsylvania, started his academic career as Assistant Professor at the University of California in San Francisco, and finally became Professor and Chairman of Biochemistry in the School of Medicine of the University of Maryland. Dr Inesi pursued research in cellular biochemistry and physiology of calcium and copper ions. He published three hundred articles, cited more than eleven thousand times.